However with this update comes access to a bunch of new tools and tricks, some of which now see use in FTL Insurrection and its optional modules. One of these new additions is Toolkits. Present in Insurrection and Captain's Remix with the upgraded Augmented Weapons Module Plus (AWM+), these one-time-use items grant you the ability to customise base weaponry into different forms, or restore the condition of worn weapons back into a near-pristine form. In addition, the Storage Key system in Insurrection now has the ability to let a daring player use multiple Keys at once when they make it to the end. There have also been a number of other changes which may be detailed in due time. Critical note to point out however, is that the 1.5.13 build of the Polish Kit will no longer be updated, and using it on 1.6 will incur glitches, most critically the weapon Lore Entries being missing. Conversely however, the 1.6 build will not retroactively work with 1.5.13 without incurring its own glitches. Since about February, I had learned of the existence of modding of this wonderful little experience and decided to try tinkering with it, trying to make it look just a little bit more polished while keeping everything the same. At some point, I took it upon myself to learn more by looking and tinkering with other people's handiwork, recognizing what everything meant and did, and from there, I had created some kind of Franken-mod. But the end result could not possibly see release. Somewhat blatantly inspired by Twinge's current effort into re-balancing the entire game, I went back upon the original, vanilla mod that I had made. Piece by piece, I strapped upon it the efforts that I had previously come up with (including the animated Artillery Beam and Drone Mode for EngiB), a swoop of aesthetic alterations from both liakad's diversityMod and my own efforts, and many gameplay-related changes (some from Twinge, some from myself). And after finally drawing a blank on what else I could do to this mod, I've decided it would be the time to release it to the community for a more widespread criticism. I present.. the, um, 'sM Polish Kit'. I'm terrible with naming things, I know. The purpose of this modification is to give FTL a graphical overhaul to solve little nuances with the game while simultaneously altering the way certain aspects such as weapons and enemies work in order to re-balance the game, all while keeping the experience overall as similar to the original as possible. After a rather gratuitous hiatus, the hybrid Aesthetic/Balance mod makes somewhat of a return with a fresh lick of paint in all the right (and wrong) places. Rewritten from scratch is the current list of modifications made within the core of the sMPK. # Various in-game descriptions, achievements and weapon properties were rewritten. # A number of enemy ships were graphically tweaked to improve the alignment of rooms within the hull and the hull within the enemy ship window. # Several player ships were graphically tweaked to improve the alignment of rooms within the hull and the placement of the shields around the hull. # The Floor Layout graphics for all player ships were completely revised to a cleaner design that grants better vision of the hull. # The icons for various player ships were altered to correct discrepancies. # The thruster flames on the Kestrel and Federation Cruisers were realigned. # The Federation Cruisers were graphically altered to support animations for their Artillery weapons. # The Federation Cruiser Type B was recoloured to enhance the appearance of the ship. # The Stealth Cruisers were graphically inverted across the horizontal axis to maintain lighting consistency with the other player ships. # The Stealth Cruiser Type C was graphically altered to reduce the excessive vibrancy of the colours and poor shadow quality. # The Zoltan Cruiser Type C was graphically altered to add shading to a window near the front of the ship. # The graphics for all crew members were altered to improve alignment with HUD and ship elements including stations and the Clone Bay pod. # Graphics from splette's 'Highres Shields Classic' mod were integrated (http://www.ftlgame.com/forum/viewtopic.php?f=11&t=24982&sid=a1537a33417787c8ca35a68e492ef9e0). # Various crew members have an increased variety of possible appearances. # Shadows were correctly applied to all internal drones. # A glitch with the firing animation for the Hull Beam was fixed. # The impact animation for the Ion Artillery carried by the Rebel Flagship was fixed to match the other Ion weapons. # All ion projectiles now rotate during flight. # All Burst Laser, Heavy Laser and Missile Launcher weapons now visually recoil when firing. # Flak weapons now have green lights on their fully-charged appearances. # The appearance of Laser Chargers was altered to keep the lit parts of the barrel from moving, fixing a lighting misalignment glitch when firing. # The glows and alignment of the Beam Drone Mark II were fixed. # The appearance of Anti-Ship Battery shots was completely overhauled. # The gibs of the Rebel Flagship were fixed to maintain the appearance of the weapon hardpoints on destruction. # Piloting: renamed to Helm, Level 3 upgrade cost decreased from 50 to 40. 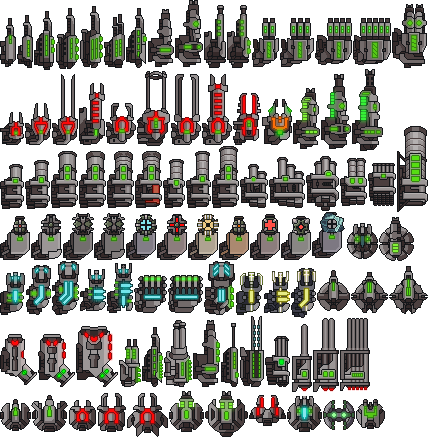 # Oxygen: renamed to Life Support, has a purchase cost of 40 scrap for mod-ships that start without the system. # Cloaking: renamed to Cloaking Device. # Shields: renamed to Shield Generator. # Engines: upgrade cost curve changed from 10-15-30-40-60-80-120 to 10-20-30-45-60-75-100. # Weapon Control: renamed to Weapons Bay, Level 2 upgrade cost increased from 40 to 60. # Sensors: renamed to Sensor Array. # Door System: renamed to Door Control, Level 2 upgrade cost decreased from 35 to 30. # Hacking: renamed to Hacking Module, purchase and upgrade cost curve increased from 80-35-60 to 150-75-90, drone travel speed decreased from 28 to 18. # Backup Battery: renamed to Emergency Power. # Various types of weapons have improved rarity within specific sector types, making them easier to find. # The names of all missile weapons were renamed to Missile Launchers, and 'M.' was added to the end of their short-names. # The cost of missile resources was decreased from 6 to 5. # Dual Shot Laser: renamed to Dual Defense Lasers, cost increased from 25 to 50, appearance changed. # Burst Laser Mark I: cooldown reduced from 11s to 10s. # Burst Laser Mark II: cooldown increased from 12s to 13s, cost increased from 80 to 85. # Old Burst Laser Mark III: renamed to the Burst Laser Mark IV, cooldown reduced from 19s to 17s, fire chance increased from 0% to 10%. # New Burst Laser Mark III: four shots, 15s cooldown, 10% fire chance, 90 scrap, rarity 4. # Heavy Pierce Laser Mark I: renamed to Heavy Pierce Laser, appearance changed. # Hull Smasher Laser: renamed to Hull Smasher Laser Mark I, cooldown reduced from 14 seconds to 13, appearance slightly changed. # Hull Smasher Laser Mark II: fire chance removed, breach chance reduced from 30% to 20%, appearance changed. # Chain Burst Laser: initial cooldown reduced from 16s to 13s, cost reduced from 65 to 55. # Chain Vulcan: renamed to Vulcan Gatling Laser: initial cooldown reduced from 11.1s to 10s, final cooldown increased from 1.1s to 1.2s, fire chance removed, appearance now fully-animated. # Laser Charger (small): renamed to Laser Charger Mark I, cooldown reduced from 6s/5.5s to 5s, fire chance increased from 0% to 10%, StealthC version cost increased from 30 to 55. # Laser Charger (large): renamed to Laser Charger Mark II, cooldown reduced from 5s to 4.5s, cost increased from 70 to 80. # Artemis Missiles: rarity changed from 0 to 3, cooldown for the player reduced from 11s to 10s. # Hermes Missiles: power requirement for the player reduced from 3 to 2. # Hull Missiles: cooldown reduced from 17s to 16s, base damage increased from 2 to 3, breach chance increased from 30% to 40%, cost reduced from 65 to 55. # Breach Missiles: cooldown reduced from 22s to 20s, cost decreased from 65 to 60. # Swarm Missiles: targeting radius removed, cooldown reduced from 7s to 6s. # Mini Beam: range decreased from 45 to 41, fire chance removed, cost increased from 20 to 40. # Halberd Beam: cost increased from 65 to 75, rarity increased from 2 to 4. # Hull Beam: cost reduced from 70 to 60. # Heavy Ion: renamed to Heavy Ion Blast, cooldown reduced from 13s to 12s. # Chain Ion: renamed to Chain Ion Blast, cooldown reduced from 14s to 12s, cost increased from 55 to 60. # Breach Bomb Mark II, cooldown increased from 17 seconds to 19, cost increased from 60 to 70. # Fire Bomb: power requirement decreased from 2 to 1. # Ion Bomb: power requirement increased from 1 to 2, cooldown reduced from 22s to 18s, cost increased from 55 to 70, rarity increased from 3 to 4. # Healing Burst: cooldown reduced from 17s to 15s, rarity increased from 3 to 5. # Repair Burst: recovers 2 points of hull damage, power requirement increased from 1 to 2, cost increased from 40 to 90, rarity increased from 3 to 5. # Stun Bomb: ion damage increased from 1 to 2. # Crystalline Weapons: firing sounds changed, can now appear in Rock sectors. # Crystal Burst Mark I: cooldown reduced from 15 seconds to 13, cost increased from 20 to 50, has a rarity of 4 in Rock sectors, has a rarity of 3 in the Rock Homeworlds. # Crystal Burst Mark II: cooldown reduced from 17s to 15s, cost increased from 20 to 70, has a rarity of 4 in the Rock Homeworlds. # Heavy Crystal Mark I: cost increased from 20 to 50, has a rarity of 4 in Rock sectors, has a rarity of 3 in the Rock Homeworlds. # Heavy Crystal Mark II: cost increased from 20 to 90, has a rarity of 5 in the Rock Homeworlds. # Flak Gun Mark I: renamed to Flak Cannon Mark I, range increased from 43 to 55, cost increased from 65 to 75, rarity increased from 1 to 4. # Adv. Flak Gun: renamed to Advanced Flak Cannon, cooldown increased from 8s to 10s, range increased from 40 to 55. # Flak Gun Mark II: renamed to Flak Cannon Mark II, volley size decreased from 7 to 5, cooldown reduced from 21s to 16s. # Combat Drones: renamed to Anti-Ship Drones. # Enemy Defense Drones: shot travel speed dramatically increased to make intercept times instant. # Defense Drone Mark II: cooldown reduced from 880ms to 700ms, enemy variant power requirement increased from 3 to 4. # Hull Repair Drone: power requirement increased from 2 to 3, repair speed decreased from 20 to 15, cost increased from 85 scrap to 95, rarity increased from 4 to 5. # Beam Drone Mark I: fire chance removed. # Beam Drone Mark II: can now be used with AE disabled, attack speed increased from 11 to 13, fire chance removed. # Boarding Drone: power requirement for the player decreased from 3 to 2, cost reduced from 70 to 50. # Ion Intruder Drone: cost decreased from 65 to 50. # Anti-Ship Fire Drone: renamed to Fire Beam Drone, power requirement decreased from 3 to 2. # Shield Overcharger: power requirement for the player decreased from 3 to 2. # Ion Anti-Combat Drone: cooldown reduced from 7s to 6s, shot speed increased, enemy variant power requirement increased from 1 to 2. # There is a small chance of race-specific augments being available in stores and events within their respective Homeworlds sectors. # Crystal Vengeance: trigger chance increased from 10 to 30%, shard deals no crew damage but inflicts both a hull breach and Crystal Lockdown, cost reduced from 80 to zero. # Rock Plating: renamed to Rock Armour Plating: damage resistance chance increased from 15% to 20%. # Zoltan Shield: renamed to Zoltan Energy Shield, cost increased from 80 to 120. # Mantis Pheromones: movement speed bonus increased from 25% to 30%. # Drone Reactor Booster: drone speed movement bonus increased from 25% to 100%, rarity increased from 0 to 3. # Titanium System Casing: damage resistance chance increased from 15% to 20%, cost decreased from 80 to 60, rarity increased from 0 to 3. # Scrap Recovery Arm: cost increased from 50 to 60. # Long-Ranged Scanners: cost increased from 30 to 40, rarity increased from 2 to 3. # Automated Re-loader: cost increased from 40 to 50, rarity increased from 2 to 4. # FTL Recharge Booster: FTL charge speed increased from 25% to 100%. # Advanced FTL Navigation: now grants full map data on sector entry, cost decreased from 50 to 45. 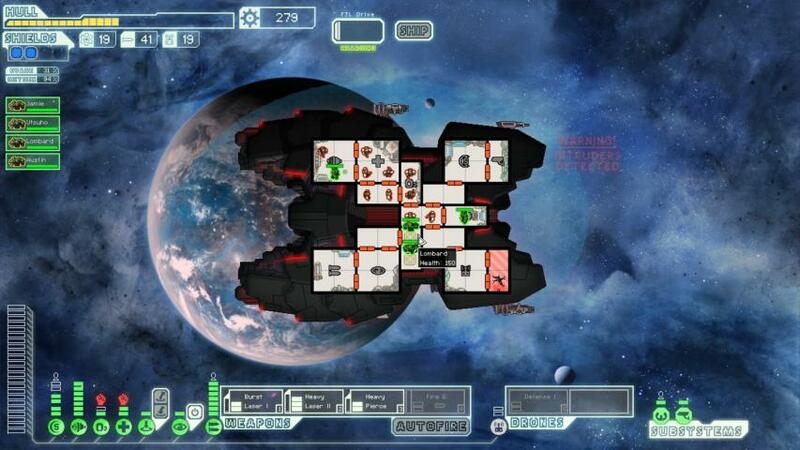 # FTL Jammer: enemy charge speed reduction increased from 200% to 300%. # The cost of various AE augments was revised. # Emergency Respirators: cost decreased from 50 to 45. # Explosive Replicator: cost decreased from 60 to 50. # Fire Suppression: dousing strength significantly increased, cost decreased from 65 to 45. # Reconstructive Teleport: cost decreased from 70 to 60. # Defense Scrambler: cost decreased from 80 to 50. # Hacking Stun: cost decreased from 60 to 50. # Life-Form Scanner: cost decreased from 40 to 30. # Drone Targeting Glitch: the effects of this in-game anomaly have been mitigated as much as possible for every ship except KestrelA, KestrelC and CrystalA. # KestrelB: default crew positions changed. # KestrelC: starts with the Distraction Buoys augment. # FederationA: default crew positions changed. # FederationB: Artillery system level increased by 1, default crew positions changed, Doors system level increased by 1, Sensors system removed. # FederationC: Artillery system level increased by 1. # MantisB: Reactor power decreased by 2. # SlugB: Reactor power increased by 1, Cloaking and Medbay/Clonebay system positions swapped, starting missiles increased by 3. # RockA: starting missiles increased by 4. # StealthB: Reactor power increased by 1, default crew positions changed, starts with the Titanium System Casing augment. # StealthC: Reactor power increased by 1, default crew positions changed, Doors and Drone systems increased by 1, starts with the Titanium System Casing augment. # CrystalB: Reactor power decreased by 1, Cloaking system removed. # Various event-specific ships such as the Mantis Cruiser quest, Zoltan Peace Envoy, Rebel Flagship Construction and the Black Raven in Slug sectors were renamed and altered. # All enemy ships that spawn with Door Control will have at least Level 2 in the subsystem. # All enemy ships that have the potential to spawn with 5 shield barriers were changed to no longer exceed 4 shields, but have an increased chance of higher shields in early sectors. # Enemies will not spawn with damaging Combat-type drones in dangerous circumstances (asteroids, pulsars, Engine Hack event, etc). # The reactor capacities of all enemy ships was revised to prevent abnormally strong reactors in Plasma Storms. # The number of crew members on board enemy ships was completely revised. There will be between 3 and 5 crew members on board small ships and 4 to 6 crew members on large ships. # All pirate ships have the species ship in their name. # All Energy ships were renamed to Zoltan ships. # Various powerful enemies including Rebel Auto-Assaults and Disruptors will not spawn in Sector 1. 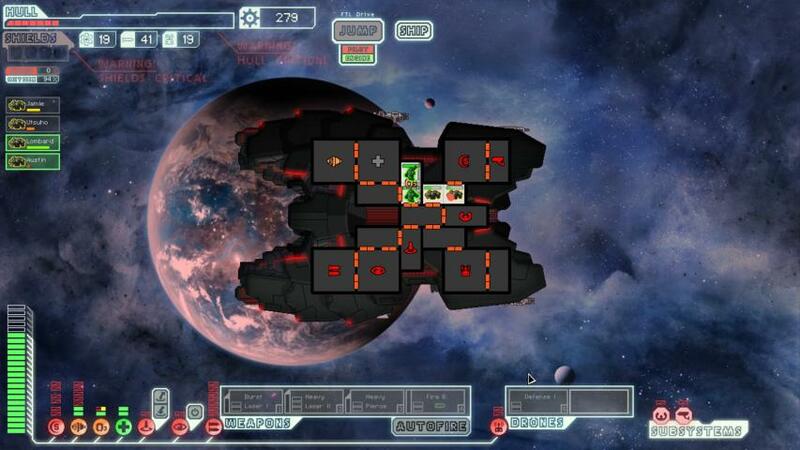 # Lanius Bombers will no longer spawn until Sector 6. # All enemy ships (excluding Rebel Auto-Scouts) that spawn with a Cloaking Device are locked to Level 1 for that system. # Various enemies named after their potential systems (eg, Hackers) will always spawn with those systems. # Rebel Auto-Assault enemy was reverted to the pre-AE configuration, with increased weapon potential but the possibility of not appearing with Drone Control. # Federation Bombers have increased weapon potential. # Enemies that often spawn with ion weapons can now equip the Chain Ion. # The Rebel Flagship layout more closely resembles the pre-AE appearance with unused systems in place during Phase One and Two. # Blue options were added to many different events for the following list of items. * Holograms (support for additional mods that use the Ghost crew class). # The number of hostile boarders in otherwise empty beacons has been increased up to a minimum of 3 and a maximum of 5. Many of these boarding events now include scrap rewards. # Event options that describe firing weapons at a specific target now require a hull-damaging weapon to be available. Some events that are affected by this now have an option to leave without doing anything. # The balance of scrap acquisition in every reward has been severely altered, secondary scrap rewards are now always low-tier. # The number of high-tier scrap rewards for crewkills has been dramatically decreased. The chance of acquiring weapons and crew from crewkills is unchanged, and the chance of finding resources is increased. # The generic Continue text for leaving beacons and entering combat is now randomly-chosen from a list of 15+ different options. # The generic ship destruction text has been changed for each faction of enemy craft, selecting between 6 different options. # Nebula exit beacons have a 50% chance of summoning an additional event. # The distribution of event types within various sectors has been rebalanced, increasing the number of stores in hostile sectors, and adjusting the number of peaceful events in Engi sectors. # The Mantis Prisoner event now has an option that has no chance of damaging the player ship, and blue options for the Teleporter and Mind Control. # The distress call event in Zoltan sectors where the player can choose to fight the Mantis or the Zoltan no longer summons an asteroid field until the player enters combat. # The distress call event where a civilian craft asks for fuel now gives a small amount of scrap on the Map Data reward, and the Reactor Upgrade reward in the event the player's reactor is already maxed. # Several events that have an option to attack an unidentified craft can now use Long-Ranged Scanners or Level 2 Sensors to identify the enemy ship before deciding to engage in combat. # The Healing Burst weapon can now be used as a substitute for most Medbay blue options across certain events. # The Giant Alien Spiders event now has a small chance of the crew failing to neutralise the threat but not losing any crew members. # The Haywire Satellite event now has blue options for high-level Weapons and Lanius crew members. # The variety of possible trade deals has been increased and revised, now allowing for the ability to pay scrap for a resource. # Events where it is possible to sell missiles for scrap now have an option for the Explosive Replicator, granting the smaller reward at no cost. # In the event that the Lost Merchant quest results in the chase scene with a pirate ship, the event now offers a double reward. # In the event the Lost Merchant event results in the stranded scene, choosing to steal the delivery has a chance of triggering a boarding scenario. # The Shields Hack event can now only appear in Rebel sectors, and only decreases the effectiveness of Shields by 2 levels instead of 50%. # The Engines Hack event now only decreases the effectiveness of Engines by 50% instead of locking them to Level 1. # The Mantis War Camp event will now summon a hostile ASB under failure circumstances. # The Intact Capture event requirements have been expanded to include Boarding drones, all fire weapons, and Hacking. # The scrap reward for the slaver outcome where the player picks between a Mantis, Rock and Engi has been reduced, and a fourth option to release everyone has been added that grants a high reward. # The first stage of the Crystal quest now summons a neutral craft depending on the outcome. # A crewkill reward for Lanius ships was changed from a crew member to a drone schematic. # A number of distress beacon events in Abandoned sectors that were completely empty have been disabled. # The Black Market Weapons Dealer event now has a blue option that can enable vision of the offered weapon before choosing to purchase or to attack. # A defective reward in the final sector that is meant to summon a repair beacon has been disabled. # A number of known errors in Crystal sector events have been fixed, including non-functional surrenders. # The Engi Virus event now has different results for attempting to purge the code, instead of halving player Shields and Engines, it will either reduce the player or enemy Shields by 2 levels. # The amount of Engines required to avoid a certain slaver event has been decreased to a maximum of Level 5. # The scrap rewards for defeating certain automated ships have been increased. # The scrap rewards for destroying slaver ships have been decreased. # The Rock and Slug Standoff event outcomes have been changed, guaranteeing a reactor upgrade for paying the fee and increasing the chance of a fight for confronting the Rock ship. # The Rock Mine event has been drastically changed to offer multiple different options for tackling the mine. # Ariadne from the Rock Marriage quest now has maxed out skills in all areas. # Slocknog from the Stranded Slug event now has maxed out Piloting, however there is a 50% chance of him not calling for a rescue should his hiring fee be ignored. # The Rebel Defector event was fixed to no longer give away in the options if the crew member will actually join your crew. # The effects of the Medbay and Oxygen hacks in their respective Slug events now happen passively with no need to select a blue option to weaken their effects. # The Slug Moon Counting event can now have any of its four answers be the correct one. # For the Random Upgrades event, it is now possible to not only get upgrades to Doors, Sensors, Shields, Engines, Weapons and Drones, but if the system is missing, it can be installed for a minor discount. # The possible outcomes for bribing the Rebel Checkpoint were improved to remove a null reward. # The Rebel Supplier event was completely rewritten to expand its options and outcomes. # The Engi Homeworlds quest final reward now has a chance of either granting Titanium System Casing or a random weapon. # The Zoltan Homeworlds quest final reward now has a chance of either granting Envoy or a random weapon. Zoltan Shields are no longer possible to acquire through this event and must be found in a store or other reward in the Zoltan Homeworlds. # The Mantis Homeworlds quest final reward now has a chance of either granting Mantis Pheromones or a random augment. # The amount of resources awared from defeating the Flagship Construction in the Rebel Stronghold has changed from 5 to between 3 and 7. # The Slug Home Nebula quest final reward now has a chance of either granting Slug Repair Gel or a random augment. # The ship that starts the Slug quest now has unique surrender dialogue that makes it easier to initiate the quest. However, in the interim, I had been slowly working where I had time on something a little more ambitious. Recalling the roots of how I learned how to modify FTL over two years ago, I started to tinker around with events, weapons, enemies. Very slowly, what could be best described as a miniature expansion for the sMPK had taken form. sMPK: Insurrection is the result of this solo endeavour, and with its modest selection of additions and modifications to the game including 32 new weapons, 6 new drones, Holograms and a simple goods trading system amongst new events, enemies and an extremely dangerous final boss, it has already been described by one streamer as an enhancement to the experience almost akin in magnitude to when Advanced Edition came out back in 2014. # Engi Support Laser: unique weapon for the EngiA-i, 2 power, 1 shot, 1 damage, 4s cooldown, 10% fire chance. # Heavy Pierce Laser Mark I: rarity increased from 0 to 3. # Heavy Pierce Laser Mark II: single-shot power, 3 power, 3 damage, 1 shield piercing, 13s cooldown, 40/40% fire/breach chance, costs 75 scrap. Rare. Enemies cannot use this weapon. # Heavy Pierce Laser Mark III: SINGLE-SHOT POWER, 4 power, 4 damage, 1 shield piercing, 16s cooldown, 70/70% fire/breach chance, costs 95 scrap. Very rare. Enemies cannot use this weapon. # Magnetic Rail Driver: heavy-piercing slugs, 3 power, 2 damage, 2 shield piercing, 12s cooldown, 50% breach chance, costs 75 scrap. Enemies cannot use this weapon. # Anti-Personnel Laser: Practical Crewkills 101, 2 power, 2 shots, 1 system and 30 crew damage each, 1 shield piercing, 14s cooldown, costs 75 scrap. Very rare. Enemies cannot use this weapon. # Automatic Laser: mini-Vulcan, 2 power, 1 damage, cooldown decreases from 7 seconds to 2 over 5 attacks, costs 70 scrap. Rare. Enemies cannot use this weapon. # Old Laser Charger Mark II: renamed to Laser Charger Mark III. # New Laser Charger Mark II: BL2 Pitchfork, 2 power, 3 shots max, 1 damage each, 5s cooldown per shot, 10% fire chance, costs 80 scrap. Uncommon. # Laser Charger Mark IV: handy new weapon, 4 power 5 shots max, 1 damage each, 4s cooldown per shot, 10% fire chance, costs 95 scrap. Rare. # Heavy Laser Charger: two-fingered salute, 3 power, 2 shots max, 2 damage each, 7s cooldown per shot, 30/30% fire chance, costs 70 scrap. Rare. # Chain Heavy Laser: designated stallbreaker, 2 power, 1-4 damage, 12s cooldown, 30/30% fire/breach chance, costs 65 scrap. Rare. # Laser Blaster: rapid rotations, 2 power, 2 shots, 1 damage each, 8s cooldown, 10% fire chance, costs 55 scrap. Fairly common. # Lance Beam: basic beam weapon, 2 power, 100 range, 1 damage, 12s cooldown, costs 50 scrap. Fairly common. # Voulge Beam: heavy shield-piercing beam, 4 power, 170 range, 2 damage, 1 shield piercing, 25s cooldown, costs 95 scrap. Very rare. # Fauchard Beam: heavy anti-armour beam, 4 power, 80 range, 2 damage, 1 shield piercing, deals bonus damage to empty rooms, 21s cooldown, costs 95 scrap. Very rare. Enemies cannot use this weapon. # Athena Missiles: basic burst missile, 1 power, 2 shots, 1 damage each, 12s cooldown, 10/10% fire/breach chance, costs 45 scrap. Rare. Only Rebel Elites can use this weapon. # Trident Missiles: medium burst missile, 2 power, 3 shots, 1 damage each, 16s cooldown, 10/10% fire breach chance, costs 55 scrap. Rare. Only Rebel Elites can use this weapon. # Ares Missiles: heavy burst missile, 3 power, 4 shots, 1 damage each, 20s cooldown, 10/10% fire/breach chance, costs 65 scrap. Rare. Only Rebel Elites can use this weapon. # Helios Missiles: incendiary power missile, 3 power, 4 damage, 20s cooldown, 80/30% fire/breach chance, costs 60 scrap. Rare. # Astra Missiles: ionic power missile, 3 power, 4 damage and 2 ion damage, 20s cooldown, 40% fire chance, costs 70 scrap. Very rare. # Atlas Missiles: mini hull missile, 1 power, 2 damage, deals bonus damage to empty rooms, 12s cooldown, 10/40% fire/breach chance, costs 50 scrap. Rare. Enemies cannot use this weapon. # Thor Missiles: power hull missile, 3 power, 4 damage, deals bonus damage to empty rooms, 20s cooldown, 10/40% fire/breach chance, costs 60 scrap. Very rare. Enemies cannot use this weapon. # Hydra Missiles: micro-missile flak, 3 power, 5 shots, 1 damage each, 45 range, 20s cooldown, 10/10% fire/breach chance, costs 65 scrap. Very rare. Only Rebel Elites can use this weapon. # Zeus Missiles: BIG F***ING MISSILE, 4 power, 6 damage, 22s cooldown, 50/50% fire/breach chance, costs 75 scrap. Very rare. Only Rock ships can use this weapon. # Ion Burst Mark I, multi-shot ion, 2 power, 2 shots, 1 ion damage each, 12s cooldown, costs 40 scrap. Uncommon. # Ion Burst Mark II, bigger brother, 3 power, 3 shots, 1 ion damage each, 13s cooldown, costs 55 scrap. Rare. # Ion Stunner: renamed to Ion Blast Stunner. # Heavy Ion Stunner: cattle prod, 2 power, 2 ion damage, 7 second stun, 14s cooldown, costs 50 scrap. Rare. # Ion Burst Stunner: double-tap, 2 power, 2 shots, 1 ion damage each, 5 second stun, 13s cooldown, costs 45 scrap. Rare. # Ion Charger Mark II: ionic elite, 3 power, 4 shots max, 1 ion damage each, 5s cooldown per shot, costs 70 scrap. Very rare. # Power Bomb: basic firepower, 2 power, 3 secondary damage, 16s cooldown, 30% fire chance, costs 60 scrap. Fairly common. # Anti-Personnel Bomb: Zoltan's worst enemy, 1 power 75 crew damage, 14s cooldown, costs 50 scrap. Very rare. Enemies cannot use this weapon. # Atlantis Torpedoes: non-piercing explosives, 1 power, 3 damage, 25 range, 30/60% fire/breach chance, costs 40 scrap. Very rare. Enemies cannot use this weapon. # Poseidon Torpedoes: double-barrel shotgun, 2 power, 2 shots, 2 damage each, 25 range, 20/40% fire/breach chance, costs 45 scrap. Very rare. Enemies cannot use this weapon. # Piranha Torpedoes: swiss-army weapon, 2 power, 5 shots, 1 damage each, 45 range, 10/20% fire/breach chance, costs 60 scrap. Very rare. Enemies cannot use this weapon. # Flak Cannon Mark III: overwhelming force, 4 power, 7 shots, 1 damage each, 55 range, costs 95 scrap. Rare. Only Rock ships can use this weapon. # Flare Cannon: versatile distraction, 1 power, 7 shots, no damage, 65 range, 30% fire chance, costs 45 scrap. Uncommon. Enemies cannot use this weapon. # All player ships can purchase an Artillery system for 100 scrap at a store. If the player is forced to reload the save file after purchasing Artillery, the Artillery Crash Fix mod will need to be installed to be able to continue. # Kestrel Artillery - Rebel Laser Blast: fires 6 lasers at once, 1 damage each, 30/30% fire/breach chance. # Engi Artillery - Superheated Plasma Cannon: fires 3 blasts, 2 ion damage each, deals 2 damage on direct contact with the enemy hull, ignites fires. # Zoltan Artillery - System Neutraliser Beam: fires a beam with extreme range, pierces all shields, 2 system damage, 10% fire chance. # Mantis Artillery - Mantis Siege Teleporter: teleports 3 Power Bombs onto enemy ships, requires no missiles to use. # Slug Artillery - Slug Siege Teleporter: teleports 3 Fire Bombs onto enemy ships, requires no missiles to use. # Rock Artillery - Zeus Missile Constructor: launches Zeus Missiles at enemy ships, requires no missiles to use. # Stealth Artillery - Stealth Glaive Beam: fires 3 damage beams with good range, no shield piercing. # Lanius Artillery - Lanius Siege Teleporter: teleports 3 bombs onto enemy ships, requires no missiles to use, 2 secondary damage each, causes hull breaches. # Crystal Artillery - Crystal Shard Battery: fires three powerful crystal shards, 2 damage each, 1 shield piercing. # The Anti-Ship Drones were renamed to Burst Laser and Mini Beam drones. # Heavy Laser Drones (Mark I/II): requires 3/4 power, deal 2 damage per shot, 20/20% fire/breach chance, costs 70/85 scrap. Movement speeds are slower then equivalent Burst Laser Drones. Rare. # Anti-Shield Drone: requires 3 power, deals 1 ion damage per shot, costs 75 scrap. Movement speed is similar to Burst Laser Drone Mark I. Uncommon. # Defense Drone Mark III: requires 4 power, advanced targeting, 400ms cooldown, costs 85 scrap. Enemies cannot use this drone. Very rare. # Mini Beam Drone Mark III, requires 4 power, same damage as Mark II but with greater attack speed, costs 75 scrap. Very rare. # Anti-Combat Laser Drone: requires 2 power, destroys combat drones outright, 6s cooldown, costs 45 scrap. Uncommon. Enemy variants require 3 power. # All augments that were previously capable of stacking with copies of itself were rebalanced and no longer made able to stack. This is to enhance their performance while retaining cargo space for trade items. # Scrap Recovery Arm: renamed to Material Processor, can no longer stack or be used as a blue option. # Automated Re-loader: renamed to Weapon Charge Booster, performance increase boosted from 10% to 15% but can no longer stack, cost increased from 50 to 80. # Repair Arm: replaced with Regenerative Armour, an event-exclusive item which doesn't use scrap when repairing the hull. # Shield Charge Booster: performance increase boosted from 20% to 30% but can no longer stack, cost increased from 45 to 60. # Several new augments were added that grant the ability to perform various tasks on empty/entry beacons. # Hull Maintenance Kit: allows the player to use spare scrap to effect hull repairs to their ship on empty beacons. # Demolitions Lab: allows the player to manufacture missiles from spare Fuel and scrap on empty beacons. # Drone Manufacturer: allows the player to generate drone parts from scrap on empty beacons. # Trade Communicator: enables players to call out to nearby traders at empty beacons, generating a variety of outcomes. # Goods Manufacturer: allows the player to create various trade items at empty beacons. The items that can be made and how effectively they are produced varies on ship equipment and location. # Hologram Generator: allows the player to create virtual crew members at empty beacons using spare scrap. # Beacon Access Kit: can be used at entry beacons to hack their database for sector telemetry, generating a variety of outcomes. # Instruction Manual: exclusive to KestrelA, used at empty beacons to display detailed articles on game information. # Combat Assist System: special augments that can be activated before combat to hamper the effectiveness of enemy systems. Only one can be used at a time, and they cannot be used near storms or pulsars. Can only appear in specific sectors. # Shield Disruptor: weakens enemy Shields by 2 levels, costs 120 scrap. Can only be found in Rebel sectors, lower rarity than other CAS augments. # Combat Disruptor: weakens enemy Weapons by 1 level, costs 100 scrap. Can only be found in Mantis sectors. # Drone Disruptor: weakens enemy Drones by 50% and disables Hacking, costs 60 scrap. Can only be found in Rock sectors. # Teleport Disruptor: disables enemy Teleporters, costs 50 scrap. Can only be found in Engi sectors. # Telepathic Shield: disables enemy Mind Control, costs 50 scrap. Can only be found in Slug sectors. # Power Disruptor: lowers enemy Reactor output by 4, costs 70 scrap. Can only be found in Zoltan sectors. # Navigation Disruptor: limits enemy Helm to 1 and reduces Engines by 1, costs 70 scrap. Can only be found in generic sectors. # Hull Integrity: increased from 20-22-20 to 22-22-22. # The medical facility is moved to the right wing section, and changes to a Clone Bay when AE is enabled. # Drone Control is moved upwards to where Shields would normally be, and Shields are moved down to the previous location of the Medbay. # The floor layout is that of the Hard Mode flagship regardless of difficulty, and two doors are added in the nose-section to grant enemy crew access to the main Artillery weapons if Drone Control is hacked. # The hull integrity of the Rebel flagship is 22 across all three phases. The room layout was altered to place Drone Control within the center of the ship and the Medbay within the starboard wing. The flagship equips the Drone Reactor Booster on all three phases and equips a Clone Bay when AE is enabled. # The crew of the flagship regenerates by 1 crew member in between phases. If Phase 2 or 3 has to be repeated, the regeneration will repeat. # Phase One: the Hacking system is reduced to Level 1, the Drone Control equips a Burst Laser Drone Mark I. # Phase Two: the Drone Control is reduced to Level 6 and equips an Ion Intruder (Boarding Drone in non-AE), two-power Burst Laser Drone Mark II and one-power Defense Drone Mark I. # Phase Three: pre-fight phase that can cause the fight to take place in a hazard, blue options for Engines and certain augments can limit its effects. Drone Control is Level 4 and equips two System Repair Drones and two one-power Anti-Personnel Drones, also equips the Drone Reactor Booster. # Weapon tips were significantly expanded upon with unique information for each individual weapon. However, the game will often glitch and fail to display tips at times. Reloading the save file will temporarily fix this. # Holograms integrated, with 50HP and an immunity to suffocation, can be recruited from stores in Engi, Zoltan and Rebel space for 50 scrap. Various blue options were added for Holograms. # Two new sectors were added, the Pirate Stronghold and [Location Unknown]. A small number of new combat and distress events were added. # New events were added to Homeworlds sectors with unique rewards for successful completion. # The ability to release crew members for mercenary work was implemented into one existing event. # A trade system was implemented into a number of new and existing events, consisting of 16 trade items split across 4 tiers of value. # The variety of enemy types was increased, adding new classes such as Dropships, Infiltrators, Chargers, Droneships and Sentinels. # The system placement within several player ships was altered, whether playing vanilla ship types or Insurrection ship types. Not forgetting the other flagship aspect of the vision of the sMPK being a highly-customisable experience, the other optional aspects of its construction were not neglected either. In particular, the Augmented Weapons Module was further expanded upon with more refinements and two additional weapon categories. # Adds hundreds of variants of existing weapons with additional properties. Certain variants can only appear in specific sector types. # The enhanced weapon tips for Insurrection are integrated into these modules, granting precise information on the stat modifications for all weapon variants. # Blazing weapons have a dark red colour scheme. Increases fire chance by 10-30% and increases cooldown by ~1 second. Increases cost by 5 scrap. # Breaching weapons have a matte black colour scheme. Increases breach chance by 10-30% and increases cooldown by ~1 second. Increases cost by 5 scrap. # Reactive weapons have a lighter colour scheme. Reduces cooldown by 1-2 seconds but reduces secondary effects of non-beam weapons by -20%. Beam weapons have reduced range and increased travel speed. # Overclocked weapons have a golden colour scheme. Increases power requirement by one, increases cooldown by ~2 seconds and increases weapon-specific attributes to amplify damage. Increases cost by 10 scrap. Missile weapons cannot be Overclocked. # High-Yield weapons are also golden in appearance. Increases missile requirement per use to 2 and increases damage, cooldown and fire/breach chance. Increases cost by 10 scrap. Only explosive weapons can equip this variant. # Piercing weapons have a matte blue colour scheme. Increases power requirement by one, increases cooldown by ~2 seconds and increases Shield Piercing by one. Increases cost by 10 scrap. # Stealth weapons share the matte blue appearance. Increases power requirement by one, increases cooldown by ~2 seconds and renders shots invisible to Defense Drone Mark I. Only missile weapons can equip this variant. # Energy weapons have a subtle shade of green. Increases power requirement by one, increases cooldown by 5 seconds and decreases secondary effects by 30-50%. Weapon gains the ability to be used without using missiles. Increases cost by 15 scrap. Only explosive weapons can equip this variant. # Focused weapons have a deep blue appearance. Decreases the targeting radius of the weapon to 40 and increases cooldown by 2 seconds. Increases cost by 10 scrap. Only weapons with Area-of-Effect targeting can equip this mod. # Sealing weapons share the deep blue appearance. Increases cooldown by ~2 seconds and causes Crystal Lockdown when hitting enemy ships. Increases cost by 10 scrap. Only crystalline weapons can equip this variant. # Ionic lasers have an ionic blue appearance. Increases cooldown by 3 seconds and grants each shot 1 ion damage. Increases cost by 15 scrap. # Ablative weapons have a steampunk brass appearance. Increases cooldown by 2 seconds and grants its attacks Anti-Armour. Increases cost by 10 scrap. # Salvaged weapons have a dulled appearance. Increases cooldown by 2 seconds, halves fire/breach chance on non-beam weapons and reduces travel speed of beams by 25%. Decreases cost by 10 scrap. # Elite weapons have a distinct platinum appearance. Applies three improvements to the weapon on an individual basis. Increases cost by 15 scrap and can only be found in Homeworlds sectors. # Named weapons share the appearance of Elite weapons and carry unique names and several improvements dependant on the weapon itself. Named weapons can only be acquired from a specific event in most Homeworlds sectors. # Signature weapons are unique rewards that have a 50% chance of being gifted at varying locations within a Homeworlds quest, and have skillsets that straddle the line between Elite and Named weapons. # Taboo weapons are similar to Signature weapons, except a less obvious path needs to be explored in order to acquire them. # Enemy ships have a chance of being equipped with augmented weapons. Pirate ships have a chance of equipping Salvaged weapons, Rebel Elites have a severe chance of equipping Elite weapons. The other core feature of the sMPK, Mod Compatability, hasn't been entirely forgotten about either. And the ability to run it with the colossal Captains Edition mod remains within its capabilities. Compared to previous iterations of the compatability patch, the new form of CE compatability is entirely new and takes the form of a completely-redone version of CE itself, known as the Captain's Remix. In addition to a significant sleuth of equipment alterations across the entire board, existing features were revised and examined in order to make more aspects of the mod viable for consideration. Significant refinements to event code and many other aspects have also addressed loading times and potential performance/crash issues, lightening the mass of the non-graphical assets by nearly 40% while sacrificing minimal amounts of CE's extensive featurelist. And for players familiar with the new weapons in Insurrection, they also make an appearance in Captain's Remix to add even more variety to the arsenal. It should be noted, however, that there are currently compatability issues in regards to other optional aspects of base CE. The Additional Music Addon does not work as intended with Captain's Remix, and naturally Endless Loot will not function either and its weapons will not behave akin to their Remix counterparts. The Infinite Addon will likely also not work at this time as well, this will hopefully be addressed in due time. A changelog of every alteration made within Captain's Remix will be coming soon. This mod requires Slipstream Mod Manager to be installed and a basic knowledge of how to operate the mod manager. You will also need a means of extracting RAR files in order to access the mod files such as 7zip or WinRAR. As a final little addition, there is now also a version of the 'kit that completely casts aside the functional rebalancing changes in favour of just the visual improvements. This was made as a personal modification so in the future when I plan on playing Hard Vanilla, I can retain access to the improved visual fidelity of the mod while not changing anything drastically that would deny the game its vanilla form.  Identified as the sM Graphics Pack (at least until I can come up with a better name, that part of my mod skillset is still as bad as ever), the only changes to it are visual ones and bugfixes to known errors within FTL's events. It is also functionally incompatible with the majority of modules within the sM Polish Kit and should be treated as a standalone entity. Here lies the original form of the post, archived for posterity. Last edited by slowriderxcorps on Wed Aug 15, 2018 2:30 pm, edited 131 times in total. When I finish my LPs of ships (or get bored with them) I'll throw this into the hopper along with the other far-reaching game changing mods. Thanks for releasing this to the community! I have to ask: in testing, did the Hull Beam ever successfully breach a room? One of the initial weapons I tried with Incursion was a breach-beam "Can Opener", but at no point was I ever able to create a room breach while using it. Kieve wrote: I have to ask: in testing, did the Hull Beam ever successfully breach a room? From what I recall, prior to version 1.03.3 of FTL, the way breaches and beam weapons worked was glitched and would never work at all. This was fixed for 1.03.3, but the devs removed the breach chances that were attributed to the Halberd, Hull (and flagship?) Beam weapons so that they didn't behave any different from before. I'm still looking at this, but just the simple font change alone makes the entire game look way better. And I love the dual laser's rotating animation. Great work, especially spell-checking CE. First ever AE-exclusive ship mod: The Extra Features! Ye Olde and Outdated Pre-AE Ship Mod Recommendation List! Yeah go back and play one of your ships with hull breach chance set to like 150 or something. It SHREDS rooms to pieces. I'm working on a ship now that uses this for all kinds of fun. Mod has just been updated with new animated graphics on most of the missile launchers introduced in the Captain's Edition, as well as a more thorough check to ensure that the graphical alterations made in 1.051 are in play. An altered version of the CE Player Ships mod is also included to attempt to solve any issues that came as a result of alterations in the patch. In addition, some of the miniship images, MantisB in particular, were reworked in an attempt to neaten them up and make them more resembling of the actual ship. EDIT: Another update, prompted by using Slipstream Mod Manager for the first time, which yelled all over the thing for reasons of XML layout. All aspects of the mod were gone over to remove XML errors, and now also included is a version of the vanilla game's files that has undergone the same treatment. I have no idea to of using the reworked files will have any effect at all on the way the game runs, but if you choose to use it, place it first in the mod orderings, before any other mod. A rather critical update was made to fix one of the boarding events that had its maximum setting typo'd. The result of the error was.. hilarious. And not even as bad as what the screenshot below would tell. Sleeper Service wrote: :D Did you survive that?